Fixed crash when trying collecting tips. Published: 2013-05-21, by Ana Gracia. 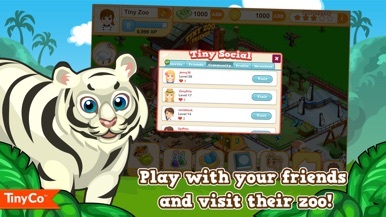 "My friends at the zoo"
Tiny Zoo Friends is one of those colorful management games for children and adults as well. First of all, you'll need to purchase some animals and breed others to form a family. Decorate the zoo with tourist attractions as well, and don't forget to collect the coins that will allow you to enhance the location, expand the zoo and create the most perfect zoo ever. The game includes many different animals and decorations that will be unlocking as you progress through the levels. 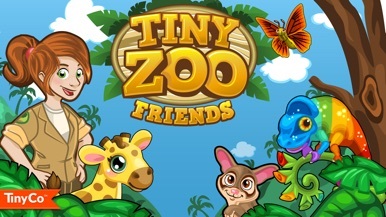 TinyCo, Inc. is the developer of Tiny Zoo Friends and other similar games which are also fun to play with. Graphics are great and the game never stops being entertaining and addictive, as it adds new features every time, giving users everything they need from a management app. 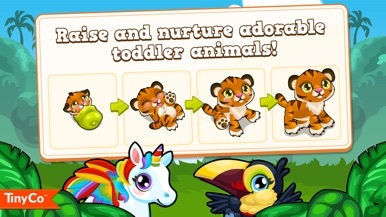 Build the BEST zoo and raise ADORABLE animals in Tiny Zoo Friends! Come back everyday to discover EXCITING new animal friends! Introducing...CUBBIES! Tiny Zoo Friends' biggest LITTLEST new feature ever! -Adopt and raise LOVABLE Cubbies from giggling INFANTS to stumbling TODDLERS! -Watch your Cubbies walk FREELY around the BRAND NEW Cubby Patch! -Every species has a variety of COLORS! Adopt them all for SPECIAL prizes! 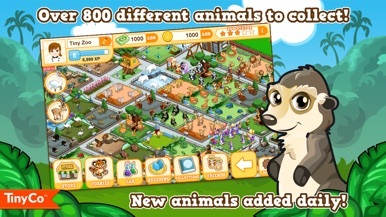 -BREED your animals to complete FAMILIES! -CROSSBREED animals in the Lab to discover NEW species! -Unlock RARE animals by finishing COLLECTIONS! -Complete GOALS to earn REWARDS! 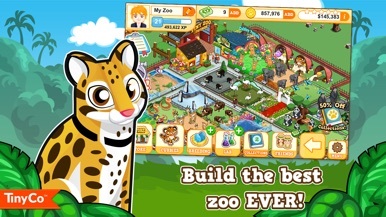 -DECORATE your Tiny Zoo with TONS of fun items! -Play with your FRIENDS from Facebook and make new ones through Tiny Social! Note: Tiny Zoo Friends requires an internet connection to play. iPod Touch users will need a Wifi connection. Please review Tiny Zoo Friends, and give us your feedback! Tiny Village is a city-building management game set in the Stone Age. There was a time when primitive humans and dinosaurs shared the world. Humans had to use their skills to survive in an environment where huge and scaring creatures were standing out there. Best way to achieve it: building safe places to live. This is the environment in which this….